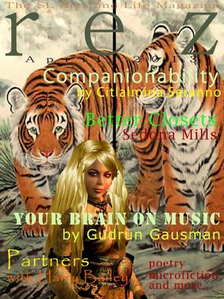 The cover article for the April issue of rez is the first of two installments of Companionability, written by Citlalmina Seranno, who delves into the life of a Registered Companion in Varahi Lusch's guild on the Dakari land sim. Sedona Mills asks us to consider what's in our SL closets in How We Can Have Better Closets. Gudrun Gausman tells us more about "ear worms" in her article This Is Your Brain On Music. The Perfect Gentleman, Harry Bailey, examines how partnerships can enhance one's SL existence in Partners For (Second) Life. Long-time contributor, Luna Branwen, brings us a touching poem, The Crossover Between SL and First Life and My Father Died in December. Crap Mariner looks at America's favorite sandwich in Match.